I never saw Queen live in concert with Freddie Mercury. I scraped together the cash to travel down to London in 1991 to attend the Freddie Mercury Tribute concert at Wembley stadium, and stayed over at my Mum’s cousin’s flat in Streatham, and that was a pretty special concert. But I would have loved to have seen Freddie strut his stuff live. 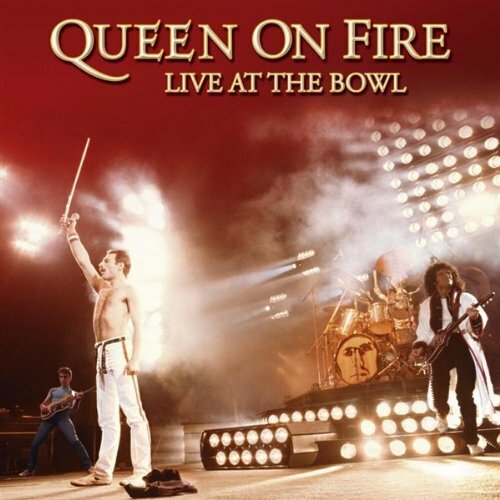 Queen on Fire is a new live in concert album (available on CD and DVD) from their 1982 tour promoting Hot Space and their Flash Gordon soundtrack album, recorded at the Milton Keynes Bowl. I’ve been listening to it for the last couple of days, and it is something special. While the DVD contains extras from the Japanese and German legs of the tour, there is nothing really new on this two CD set. No new, previously unreleased tracks or covers. Even the CD booklet contains the most sparce details about the show or the tour, instead filling each page with photographs of the band in concert. But that aside it does show just what an incredible band Queen were, and what a fabulous frontman Freddie was. This is fun, intimate and wonderfully exciting album. For this Queen fan anyway! After diocesan synod last night my priestly friend David asked if I’d heard about a website called Movie Ministry dot com. He’d been talking about it on BBC Radio Scotland last week, apparently. I’m a Radio 1 / Radio 4 kinda guy so had missed him. The site draws out positive Chrisitan messages and illustrations from a huge range of mainstream films, from A Beautiful Mind to X-Men 2. Great for sermons, I would imagine. Two things I don’t do: coffee and cigarettes. But that doesn’t stop me wanting to see this new film by director Jim Jarmusch. It looks fun. It’s on just now at the Cameo cinema at Edinburgh’s Tollcross.